I am getting hungry!! It's 10:15 PM here. lol Looks great! Nice lunch too. Yumm. Thanks! In Singapore they are only ever available for breakfast... but yes it would be a nice lunch. In Malaysia, where it is called "murtabak", it is sold in Indian Muslim restaurants and stalls, and usually includes minced mutton, along with garlic, egg and onion, and is eaten with curry gravy, sliced cucumber, onions and tomato sauce. Murtabak also usually includes mutton in Yemen. In Indonesia, particularly Jakarta and other cities, it is called "martabak", and has two versions: a sweet one, and a savory one with egg and meat. Lately, vegetarian murtabaks and other forms of murtabaks with chicken and other stuffings exist and can be found in many Indian Muslim restaurants in Singapore, most famous being those restaurants facing the Sultan Mosque near Arab Street. That is the VERY PLACE I was having breakfast most days in Singapore. Zan Zan Restaurant and Victory Restaurant are two I have visited since 1994.... there is at least one other... also good... but I don't know the name. The Singapore meal shown in photo above is in Victory Restaurant. Coming from Philly, I am very big into Italian food. Then later came along the French Restaurants and smaller Bistro's - so got into that too. But, I am really lacking in Indian, Thai, Chinese, etc. types of food. That will be one of my New Year resolutions I think. Thanks for the PUSH... I needed it. Am into baking now too. Love that. I like Asian food. NZ and Australia have for years absorbed Asian immigrants... and so there is a lot of Asian cuisine. I will say.... the sort of food we get as a "Westernised" version of various Asian foods (which is great)... is not quite the same as you get on the streets in Asia. Chinese restaurants here (for example) serve more exotic dishes... I guess it is the "banquet" stuff... rather than the everyday food of each country. And Indian Food.... is almost traditional British food now. It is very popular in UK. Got this as a Xmas gift, and have been cooking steaks, chops & chicken with it. You can cook food to an exact temperature (to rare, med rare, med, done, well done) every time. So far, everything I cooked this was delicious: juicy and tender. To use it, you put the food item into a zip-lock bag, push out the air by submerging it into the water filled pot, then seal the bag and cook it in water preheated to the required temperature. For meat, after it's done, you sear it in a pan for about a minute each side. It takes anywhere from forty minutes to a few hours to cook this way, depending on what you're making. But the HUGE advantage is that the food will not overcook. Even if you leave it in the pot for 12 hours or more, it will remain the same degree of done-ness and tenderness. 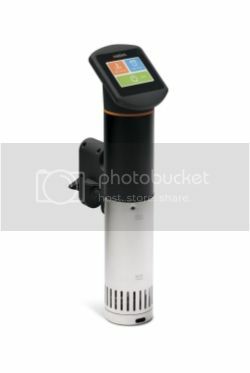 Chefs at gourmet restaurants have been using industrial sous vide cookers for years. They pre-cook steaks before lunch or dinner-time rush, and have them ready to plate minutes after receiving an order. I tried this prepping-ahead method with a 2-inch thick sirloin steak yesterday, immersing it in the water pot at 11:00 am, at 135-degrees F for medium-rare. I left it there until 6:00 pm, and it was perfectly medium-rare and juicy after searing and serving. My next experiment will be to slow-cook tougher grades of meat, and see how that works. Convinced more then ever it's a great cooking tool. Also Sous Vided frozen vacuum sealed packages of halibut and swordfish. That way didn't have to mess with zip-lock bags. It was relatively quick: just dropped the sealed packages into the water pot; 70 minutes from frozen to perfectly cooked, plus a minute searing of the filets each side. Thank JJ. I'll look at vmix right now while I'm thinking if it. I love sauces so that is defiantly a plus. 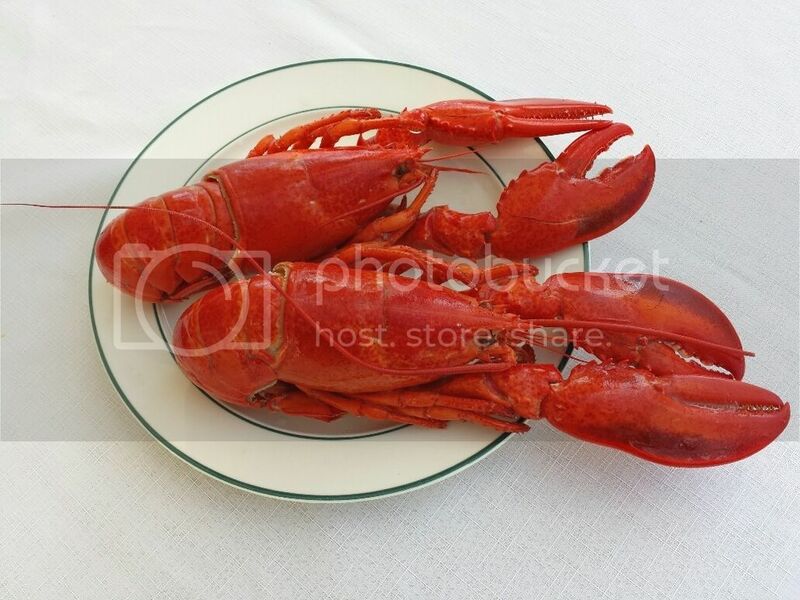 We had a "mission" to buy two Frozen Canadian Lobsters... a special we saw last week "2 for $20"
I LOVE lobster (crayfish) but have not treated myself in years. I did "have words" with a shop assistant who told me that the manager had received other similar complaints.... but "price ita stays!!" Those look so delish! Corn on the cob too?? Enjoy! Just had some green salad and a bits of french bread. My own concoction "Thousand Island Dressing"
Perfect!! Sounds like a great treat for the two of you. I have some tails in freezer from an Omaha steak gift three years ago...I wonder if I should dare defrost them. I heard about www.cousinsmainelobster.com on shark tank. May try the lobster roll kit sometime! I'd rather somebody else did all the messing about and just gave me the tail meat.. and large claw meat. Lol Rumple back in the day worked at a place called Wagon Wheel (froggie might know it) Rte 18 Wareham and their claim to fame was 'twin lobsters' or all you can eat fried seafood for $9.95. That's where I learned the smaller 1.25-1.5lb lobsters are actually the best for meat as once they get to 3.lb or so it requires a commercial process to efficiently break them up. Getting meat from legs & body is definitely a skill best learned as a kid. We usually serve with corn & baby red potatoes. Along the way family insisted not dinner without spinach artichoke dip in bread bowl. Which is hardest part to make since spinach must be defrosted & squeezed dry, then sqeeze & chop artichokes to add to knorrs dry vegi dip with 1/2c ea mayo, sour cream & shredded parmesan into prepared round bread w/ insides torn apart & toasted w dip. LR, that spinach dip sounds delish. I agree dip sounds nice... but... " spinach must be defrosted...." You Yanks do know about fresh stuff? Raw. Cook it yourself? I do have some spinach (in stock as it were)... gonna make my own recipe vegetarian Lasagna at some stage. Some of us do. I hate frozen spinach, but love it raw and cooked fresh.